Think of Ireland and “stately homes” is probably not the first phrase to come to mind. Not for me, anyway. Instead, I pictured green hills, ancient ruins, and delightful pubs. (Or was it leprechauns, musicians, and Guinness? One could make many such lists.) What tourists often forget is that Ireland before the famines of the Nineteenth Century was incredibly prosperous, and when the wealthy put down roots, they built big. A lot of their big homes still remain, as a glance at Wikipedia reveals. 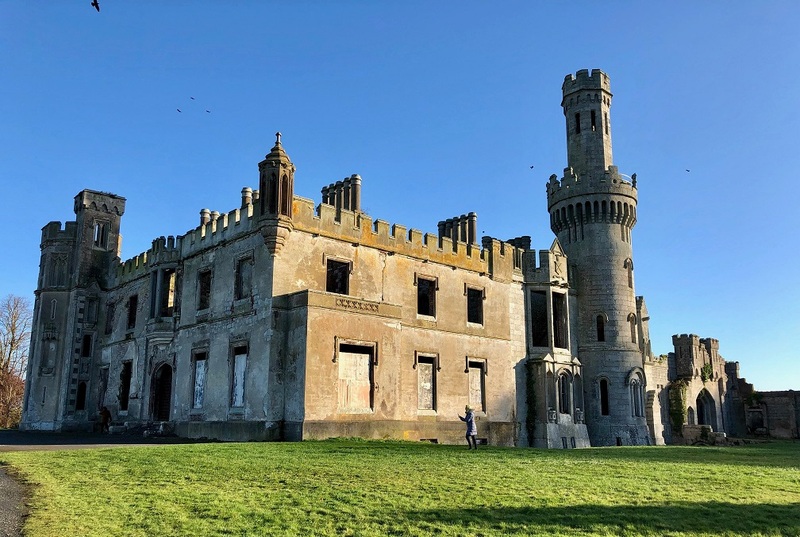 Some are now ruins, others are the crown jewels of golfing resorts, but a fair few remain in excellent condition and available for sightseers to visit, with tours of the house, access to the gardens, and a café for after. A quick aside, before I get into the ones my wife and I visited: the question I was most asked while living in Dublin was “When are you going to write your ‘Irish’ novel?” Lacking a good answer to that question, I tended to mumble something about faerie and “We’ll see what emerges.” Well, what emerged was a middle-grade fantasy novel set in a big house that might possibly be haunted. Her Perilous Mansion is the unintended consequence of visiting so many stately homes in a row and letting my subconscious run riot. I’ll call out the ones that inspired specific parts of the book. Although it’s a ruin, we absolutely loved this former great house, which is open now as a public park. Duckett’s Grove is impossible to capture in a single photo, but we did our best. All old homes have history, but I particularly like this one. When the widow of the last heir fell out with her daughter, Olive, she left Olive a pittance out of an estate valued at nearly £100,000: this came to be known as “the angry shilling”, which is a title someone should totally use. The huge house burned down under mysterious circumstances in 1933. It’s purported to be haunted by a Banshee ghost, but we didn’t see anything while we were there. Too busy gawping at the tower, probably. 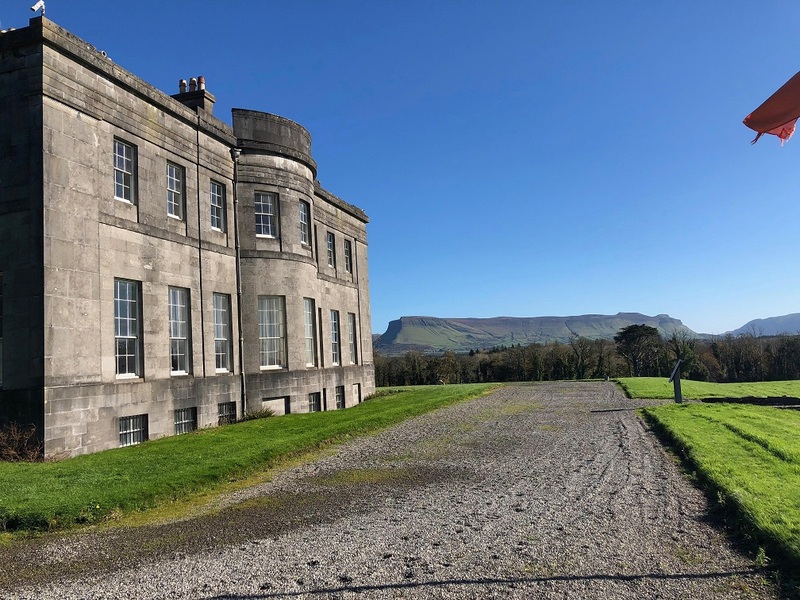 A fascinating place for many reasons, austere Lissadell House was the first in the country to have gas piped in and, when sold in 2003, the only stately home in Ireland to retain the furniture built for it, designed to compliment the architect’s plans. Lissadell may have been considered austere, but the view is anything but. Also, William Butler Yeats wrote a poem about it once, and whether that or the inhabitants (revolutionaries, suffragettes and poets all) made it famous is anyone’s guess. Possibly both. There are so many other things I could mention about this place, which is my personal favourite, but I’ll limit it to two: there’s a memorial to Leonard Cohen on the grounds (he played there, apparently); and the kitchen features distinctive iron columns (thus earning it a key position in Her Perilous Mansion). It’s worth trekking nearly to the southernmost tip of Ireland to see this place. (If you need a snooze at the end of your journey, you can stay there overnight.) The grounds are spectacular and so is the view over the nearby water. The garden has seven terraces, giving it a tremendous sense of size and opulence. Even the stables at Bantry House were built to impress. Irish tour guides tend to be very good, but none surpassed the young historian who took Amanda and I around Newbridge Demesne the day we visited, shortly before we returned to Australia. He was absolutely first-rate. Visit just for him, if you can. (They accept tips, btw, and it’s usual to offer one, I’m told.) You can also visit the side-room full of statues that make a brief appearance in Her Perilous Mansion. Newbridge: small but perfectly formed. There’s a working farm on the estate, one that comes with owls and peacocks as well as the usual complement of beasts. Another highlight. This is one of two places on this list that are so famous they probably don’t need mentioning. If you’re anywhere near Galway, just go. 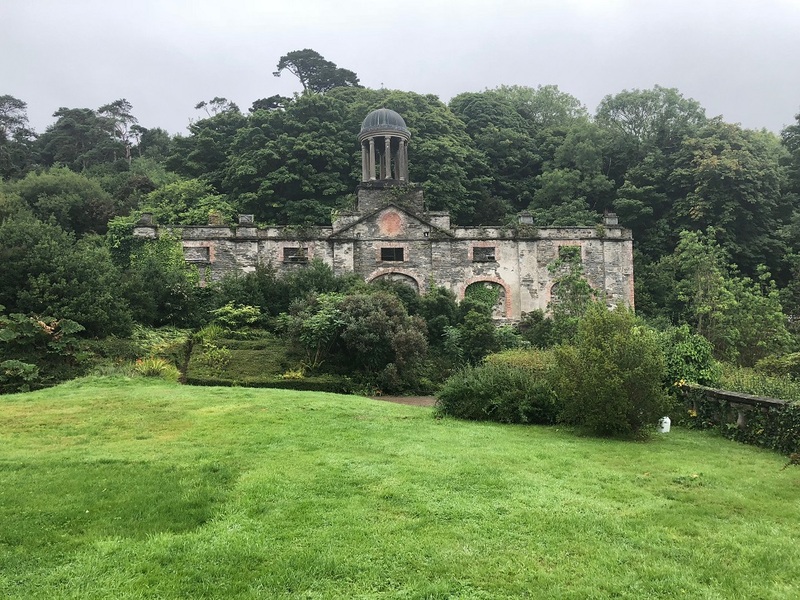 You’ll love it, if not for the house itself, then for the miniature Gothic folly nearby or the walled Victorian Gardens–or the view across the lake, which everyone photographs. Kylemore. Nothing more needs to be said. Nuns, bombed out of Ypres during World War I, moved in a century ago and have left a legacy of religiosity that sometimes seems a bit trippy (there’s a giant cross on a mountain nearby that I initially thought was a hallucination) but don’t let that put you off, or the fact that the tour of the house isn’t extensive. It’s a very special place. We’ve been twice. Grand old Strokestown will always be one of my favourites. The café uses produce from the gardens to make delicious soup, so don’t miss that. This looks like a castle but is in fact a crenelated mansion built in the 1870s, now the centrepiece of a mountainous national park sharing the name. The original landlord was apparently so cruel that someone cursed the castle, leading (it’s said) to none of the subsequent owners leaving heirs to bear the family name. 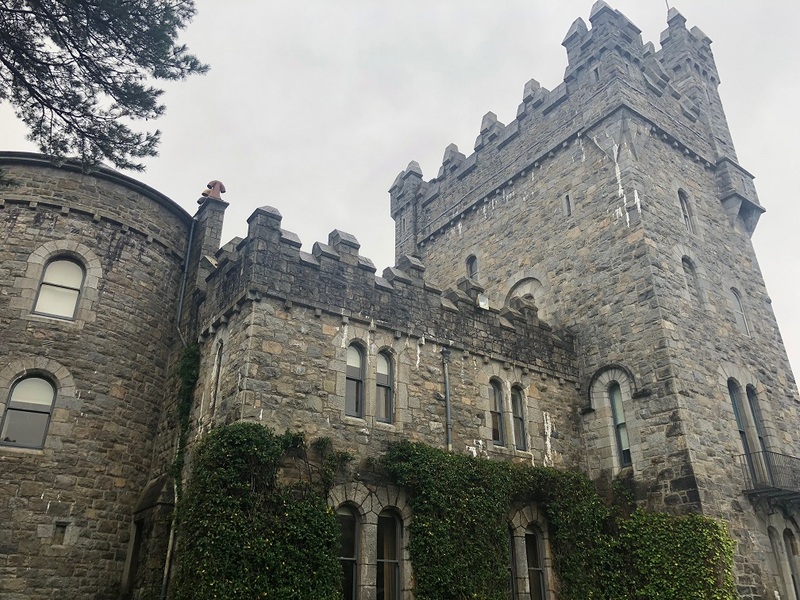 Glenveagh Castle doing its best impression of an actual castle. The gardens are lush and full of details like Balinese statues that look deliciously out of place amongst the green. There’s also a “Gothic Orangery” on the grounds, but we never found out what that was. The not inconsiderable walk to the castle is well worth the effort. It’s such a rewarding place, with all sort of nooks and crannies to explore. Justifiably regarded as one of the finest sites in Ireland, Westport House boasts extensive activities on the grounds for all the family, including giant swan paddleboats, if you go for that kind of thing. The house itself is magnificent. Elaborately painted ceilings and a quaint miniature library annex made it into Her Perilous Mansion. A photo of my wife taking a photo of Westport. In fact, I took extensive research photos here. No one complained. Sometimes these houses are privately owned and cameras are not allowed to be used inside. Westport House was not one of them. This is another faux castle, actually a neo-classical house of very grand appearance. I mention this mainly because I have a cool photo of it–also to note that many of these estates close for winter, although the grounds may remain open. Alas, we left visiting too late, so had to content ourselves with merely walking about the place, stickybeaking where we could. Worth it. ‘You can never have too many pillars.’ –The architect of Castle Coole, probably. Other houses we didn’t enter include Burtown House and Gardens, Co. Kildare (there’s a delicious restaurant called the Green Barn and super vegetable garden we were able to stroll through) and Turlough Park, Co. Mayo (on the extensive grounds of which is the excellent Museum of Country Life). Although smaller in scale than the other places I’ve listed, this house is a real treasure. A Sixteenth Century townhouse built by a merchant for his family, it’s the only one of its type surviving in Ireland. 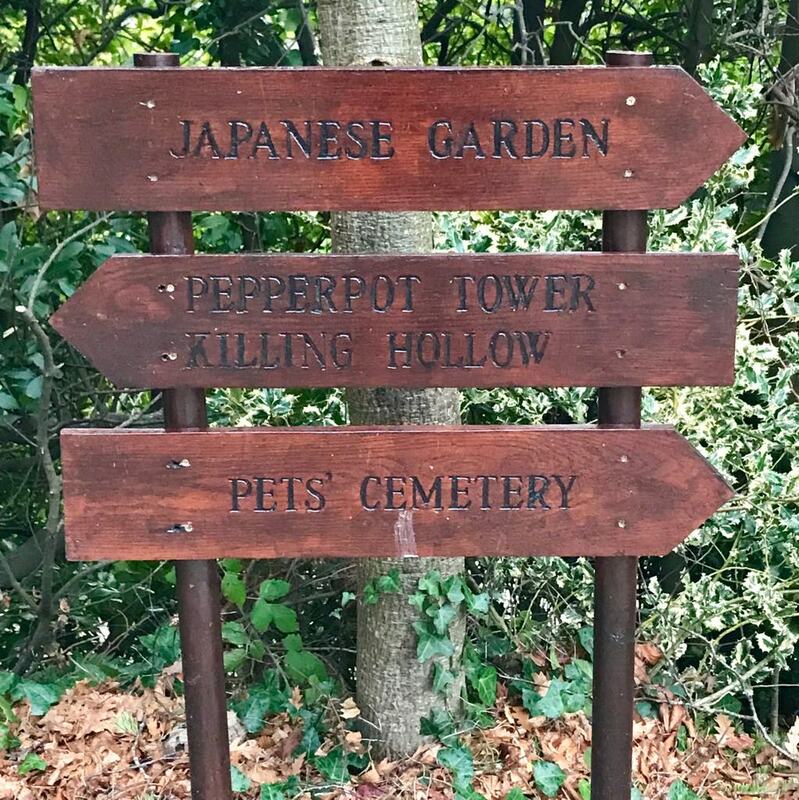 Actually three houses built in succession, with courtyards between them, it’s home to a large number of archaeologically significant objects and has a lovingly restored garden at the rear of the property, which is a must-see. Close at hand is the somewhat grander but still relatively modest Butler House, which is now a guest house. When we were there, the gardens were covered in rather bizarre Xmas ornaments, so we didn’t get a clear sense of what it looks like when sanity prevails. We’re told they’re rather nice. 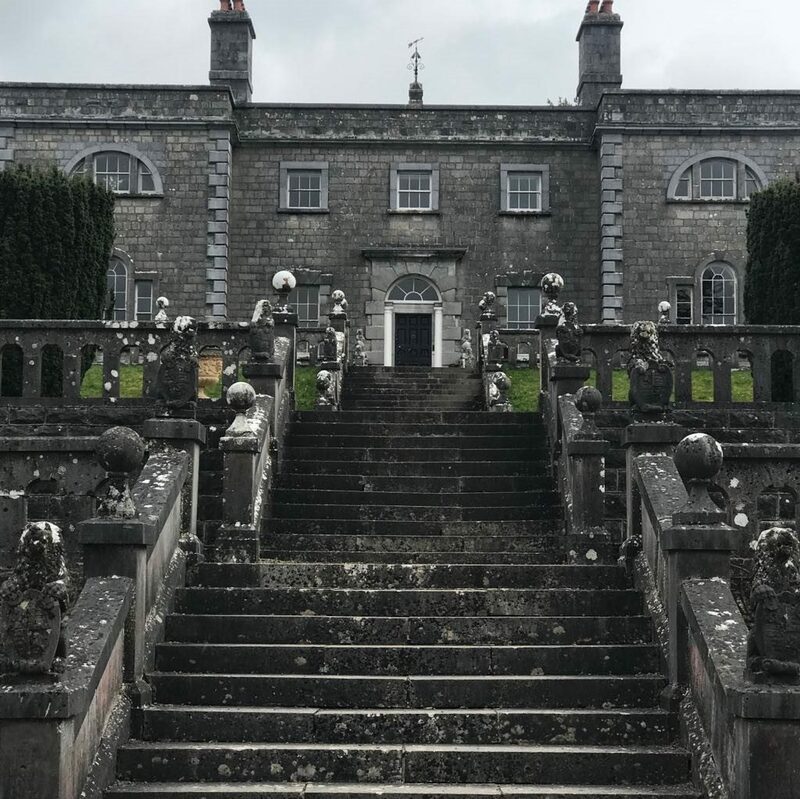 This is Amanda’s favourite stately home in all of Ireland. I can’t argue the point because sadly I missed that trip, but in photos it looks very stately indeed. Its history, however, seems bland: not a ghost, executed landlords, or disgruntled heir to be found! Still, it’s high on my list of places to visit when I return. See you there, perhaps? Everything points to the weathervane at Belvedere. 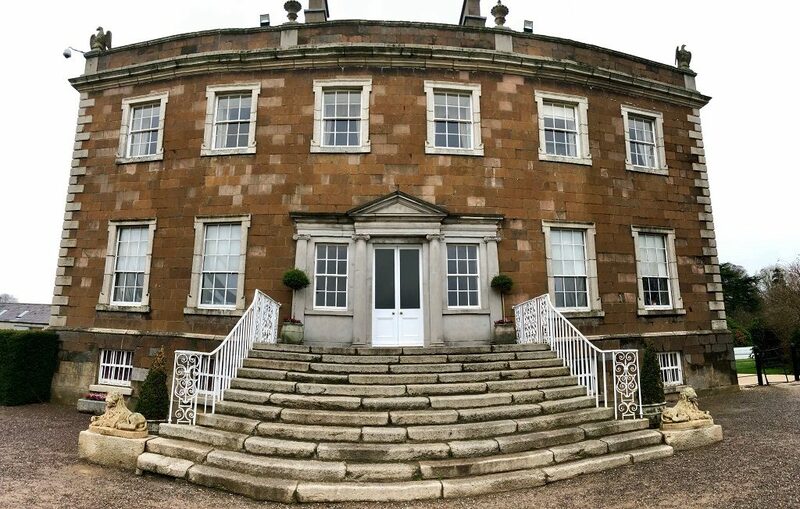 Stately homes don’t have to be the biggest or the best to be worth visiting. Sometimes being close to Dublin and possessing a great story is enough. We loved Belvedere House for both reasons. The story goes something like this: 1st Earl of Belvedere married a reluctant actress and treated her very badly, effectively imprisoning her, in the end. Suspicious of his brother, who lived next door, he erected a massive spite folly, the “Jealous Wall”, to block the neighbouring estate from view. This folly is a thing to behold. The gardens and park are also delightful, and the tour of the house is more inclusive than most. Its floorplan informed the manor in Her Perilous Mansion. Some might say I’ve saved the best for last. 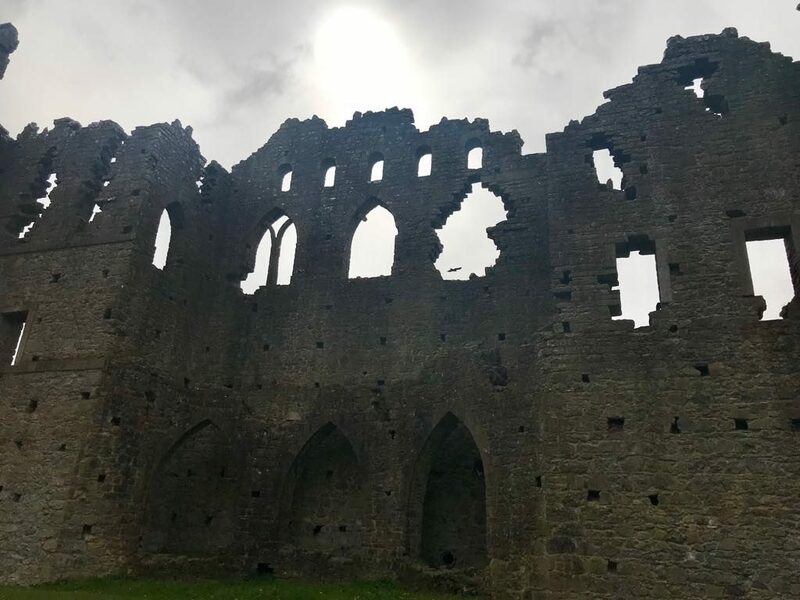 It’s certainly the grandest and possibly the most famous, and also a very convenient drive or bus trip from Dublin: therefore, perfect for a day trip. Come visit, have lunch or morning tea, then move on to the waterfalls and nearby Glendalough. 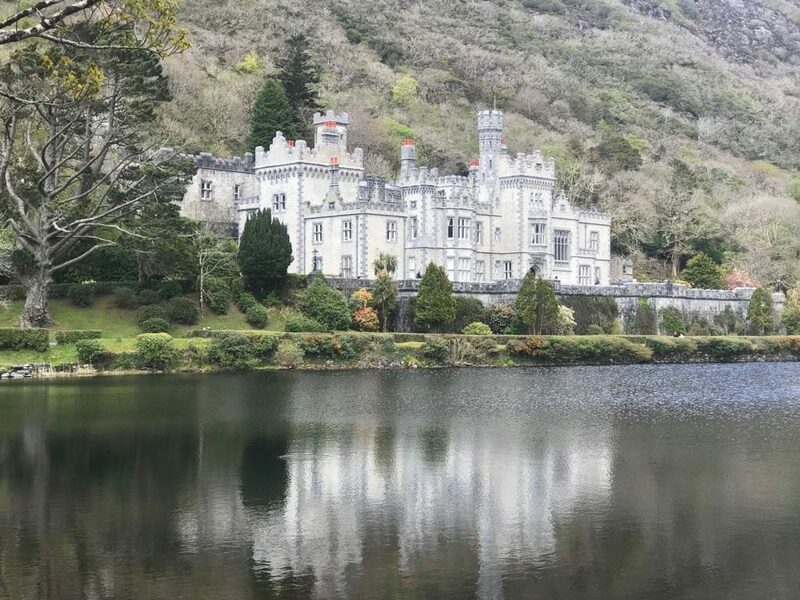 The place is a treasure-trove of wealth and beauty, and a powerful reminder of just how rich Ireland has been in its recent past. The grounds of Powerscourt are as impressive as the house. Do consider forgoing a stone circle or two to visit some of these amazing old homes. You’ll be amazed, and you’ll learn a lot about Irish history, too. There’s enough material here for a dozen books! Powerscourt the Movie, a brief synopsis. Sean Williams is a #1 New York Times-bestselling author of over forty novels and one hundred and twenty short stories for adults, young adults and children. 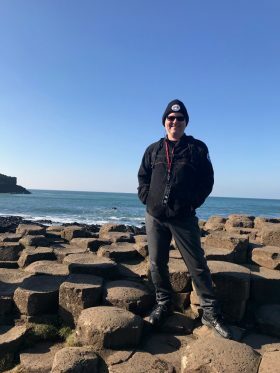 Normally, he lives in South Australia with his wife and family, but 2018 saw him living in Dublin and loving everything about it. Have Sword, Will Travel and Let Sleeping Dragons Lie, launched at Octocon 2018, are the first adventures in a new middle-grade series co-written with Garth Nix.